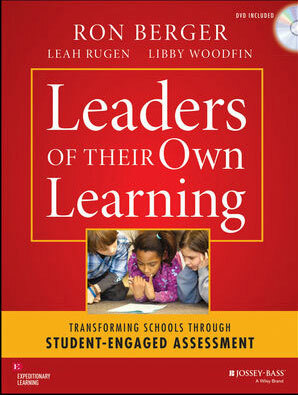 The following excerpt is from "Leaders of Their Own Learning: Transforming Schools Through Student-Engaged Assessment," by Ron Berger, Leah Rugen, and Libby Woodfin. This excerpt is from the chapter entitled "Using Data With Students." At Genesee Community Charter School in Rochester, New York, third-grade teacher Jean Hurst leans in and listens intently as her student, Jacelyn, reads aloud. Hurst is listening for greater fluency in Jacelyn's oral reading, a skill they have been working on for several weeks. As she listens, she hears greater cadence and confidence in Jacelyn's voice. Hurst is careful to note miscues and the length of time it takes Jacelyn to read the passage. They start their follow-up discussion by reviewing Jacelyn's previous goals and successes and reviewing a chart that shows the growth in her reading level. They focus in on fluency and the word substitutions Hurst heard as Jacelyn read aloud. "Let's take a look at this word," says Hurst. "Read it back to me." Jacelyn struggles at first, but calls out the word proclaims. Hurst shares that when she read it aloud, she read it as announces. "We call that a substitution. Do you think you know what happened as you were reading?" Hurst asks. Jacelyn thinks a little more and shares, "Well, I wasn't sure what the word was but I knew it had to mean something like says or announces because of where it was in the sentence." Hurst and Jacelyn discuss how her substitution enabled her to make sense of what she was reading without slowing down her overall rate. Hurst shares with Jacelyn her Developmental Reading Assessment (DRA) fluency score, and they compare it to older data. It is apparent that her fluency score is improving. Jacelyn is reflective about her growth as a struggling reader: "It's kind of how there are all kinds of runners. Some are fast and some are slow, but we all need to cross the finish line. Well, I just need to move faster than everyone else to get where I need to be." The use of data has helped her (with the guidance of her teacher) to set goals that have moved her from a late kindergarten level in September to an early third-grade level by the end of the year. As Hurst points out, "Although she's still not at grade level, she's made two years of progress and making that progress visible through the use of data has helped Jacelyn to become a more motivated and informed reader." Students use their classwork as a source for data, analyzing strengths, weaknesses, and patterns to improve their work. Students regularly analyze evidence of their own progress. They track their progress on assessments and assignments, analyze their errors for patterns, and describe what they see in the data about their current level of performance. Students use data to set goals and reflect on their progress over time and incorporate data analysis into student-led conferences. Teachers and school leaders everywhere collect and analyze data to make informed decisions about instruction that will support all students in meeting state and Common Core standards. However, in many schools, the power of data to improve student achievement is not fully leveraged because students are left out of the process. The most powerful determinants of student growth are the mindsets and learning strategies that students themselves bring to their work—how much they care about working hard and learning, how convinced they are that hard work leads to growth, and how capably they have built strategies to focus, organize, remember, and navigate challenges. When students themselves identify, analyze, and use data from their learning, they become active agents in their own growth. They set personal goals informed by data they understand, and they own those goals. The framework of student-engaged assessment provides a range of opportunities to involve students in using data to improve their learning. As the story about Jacelyn illustrates, using data with students has the potential to build reflective and confident learners with key dispositions of college and career readiness. Using data with students means much more than sharing test results with students a few times a year. The practice is most effective as an ongoing part of a classroom culture in which students are always collecting and analyzing information in order to improve. Data driven has become a ubiquitous phrase in schools today. Typically it refers to using the results of standardized tests—yearly state assessments and interim district assessments—to inform the focus and pacing of classroom instruction. If we limit our use of data to this purpose, however, we are missing the great potential of gathering data related to a wider range of evidence of learning (e.g., individual patterns in writing and math assignments, homework habits, reading stamina). Data of this kind can be collected and analyzed with students and by students and can be used to help them set and achieve goals for improved learning. The following purposes for using data with students point to the power of the practice to engage and support all students. In order to establish and reach aspirational goals, students must first be aware of their starting point. Too often, in the name of protecting children’s self-esteem, we avoid explicit discussions of standards and where students stand in relation to them. Rather than boosting confidence, such “protection” actually prevents students from advancing and blocks their understanding of what it takes to succeed. Providing students with the opportunity to identify their own strengths and weaknesses through data analysis gives them a powerful tool for learning. It moves conversations about progress from abstract, generic goals (e.g., try harder, study more) to student-determined, targeted goals (e.g., increase my reading level by 1.5 years, master 80 percent or more of my learning targets, ensure that 100 percent of my homework is fully completed and submitted) and provides them with skills to track those goals. Of course, making data transparent requires a safe classroom culture, a topic that will be explored further later in this chapter. their learning over time and have concrete evidence that they know more and can do more than they could previously. And, it develops the connection between hard work and achievement, replacing the idea that "some kids are smart"with "if I work hard, I'll get better." Too often what it means to achieve or reach a standard stays shrouded in mystery. Students and their families may have no idea why they receive a certain grade or why they continue to struggle with learning a particular content area. Using data with students is one way to shine a light on learning. It helps students see actual evidence of what they know and can do. It also helps shift their thinking from all or nothing—I met my goal or I did not meet my goal—to a more complex understanding focused on growth over time (e.g., I've successfully mastered 75 percent of this content since my initial assessment; to reach my goal of 90 percent or more I need to work on . . .). Data inquiry and analysis is a fitting and rich component to many schools' professional development cycles. Yet, it is often removed from the classroom and something that happens about rather than with students. Bringing data analysis into the classroom is one more example of transforming what is traditionally reserved for adults into an opportunity for student leadership. Although investigating data takes different forms at different developmental stages, even the youngest students can and should be given opportunities to explore data related to their academic and character growth. Many of us have preconceived ideas about data. For that reason, it's important that we clear up a few misconceptions. Although an appropriate starting point for many teachers may be to record and share data about basic skills and knowledge (e.g., identify the seven continents, 100 Leaders of Their Own Learning distinguish between parts of speech, name the parts of a cell), students can and should use data to uncover and understand many kinds of student achievement. These include critical thinking, clear communication, content knowledge, increased engagement, character, and the production of high-quality work. For example, when students have opportunities to track their own patterns of work and behavior (e.g., when they are focused and engaged, when they get confused, or when they have behavior challenges), they gain the power to improve their own learning strategies. Higher scores on state, national, and school-created assessments can be one goal of data use, but shouldn't be the sole focus. Rather, the goal should be to embed data into classroom routines and a wide range of student centered instructional practices to improve student achievement and engagement. Learning to analyze and track data about individual and class performance helps students take responsibility for their learning. Although it is wise to begin student-engaged data practices with things that are easy to count (e.g., mistakes in math assignments, minutes spent on independent reading), there is also a great deal of qualitative data that can help student growth. Rubrics, which are composed of qualitative descriptions of student work, are filled with this kind of data. Many recording forms, such as journals, note catchers, and entrance and exit tickets can be powerful data sources to track the why and how of student thinking. These kinds of forms are opportunities for students to back up their ideas with evidence, an essential skill for meeting Common Core standards. Engaging students with data analysis enhances their ability to make evidence-based claims, a skill that permeates the standards. Using data reflectively (e.g., engaging in error or success analyses) helps student meet the Common Core's more rigorous (and often complex) standards. Noting trends focuses students' attention on how to improve. Understanding data about one's own progress toward meeting standards is a key to developing the independence and self-direction emphasized by the Common Core. If data tracking about progress remains solely in the possession of the teacher, students are deprived of the opportunity to actively work toward standards. Their partnership in the process increases their engagement and motivation along with the likelihood they will meet with success.